Outdoor Recreation Northern Ireland has been commissioned by Derry City and Strabane District Council to help promote the area’s Slow Adventure offering. If you want to get away from it all, slow things down and reconnect with nature Derry and Strabane is the place to be on 23rd & 24th September. Escape to the stunningly beautiful rural setting where local food will be combined with outdoor activities for a truly authentic and natural experience. 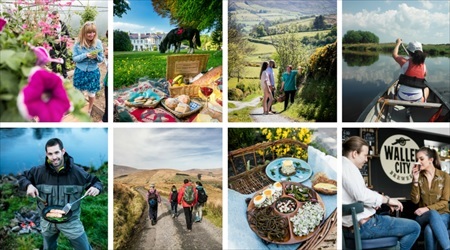 With 8 unique experience packages being offered over the weekend you will have the opportunity to walk through the Sperrin Mountains foraging for food, see how artisan cheese is produced or have a go at traditional fishing. You can also step out on an Irish walking tour, horse ride through the wilderness or go canoeing through scenic waters. Knowledgeable guides will ensure your experience is like no other, go horse riding through the stunning grounds of Beech Hill Country House Hotel before enjoying cream tea in the elegant settings or paddle along the idyllic River Foyle by canoe before sampling some delicious beer from the Walled City Brewery. If you’d prefer to keep your feet on dry ground then a guided walking tour through the rolling hills of the Sperrins followed by a delicious artisan meal or tour of a local organic farm may be more up your street. These fantastic one of a kind experiences are being offered as part of a European funded transnational programme to promote slow adventures in Scotland, Norway, Finland, Sweden, Iceland, Ireland and Northern Ireland. With added extras available for those that book during the weekend, don’t miss out on the opportunity to be one of the first to try these experiences on the 23rd or 24th September. Many of the packages are also available to book all year round so you can get planning your next adventure.